Thank goodness for Rate the Dress! 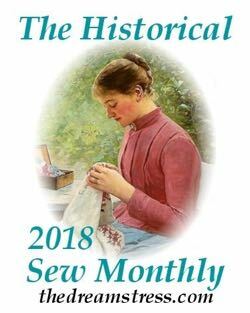 It means that I have a definite excuse to focus entirely on historical fashions at least once a week! We were having such a good run on Rate the Dress: so many 8+ ratings in a row! And then I posted the pink, pigeon breasted, ruffle-dy, smock-dy, totally over-the-top 1900s frock-dy last week. Pop! There went the high ratings bubble! It wasn’t too terrible: there were a lot of 6s, and just enough 8s and 9s to bring it up to a nice, round 7 out of 10. The sitters gown makes striking use of gold striping to emphasise the cut of the gown, and the fashionable features. The stripes on the bodice highlight the bust and the extremely wide neckline, and add to the illusion of a small waist. 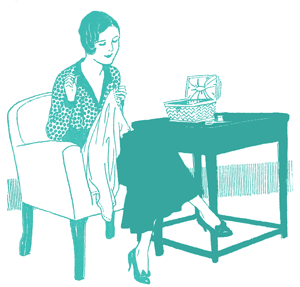 On the sleeves, they mirror the widening and tapering of the sleeve. The stripe motif is echoed on the very sheer partlet, which does little to cover the sitters bust, or to hide the beautifully worked border of her chemise. 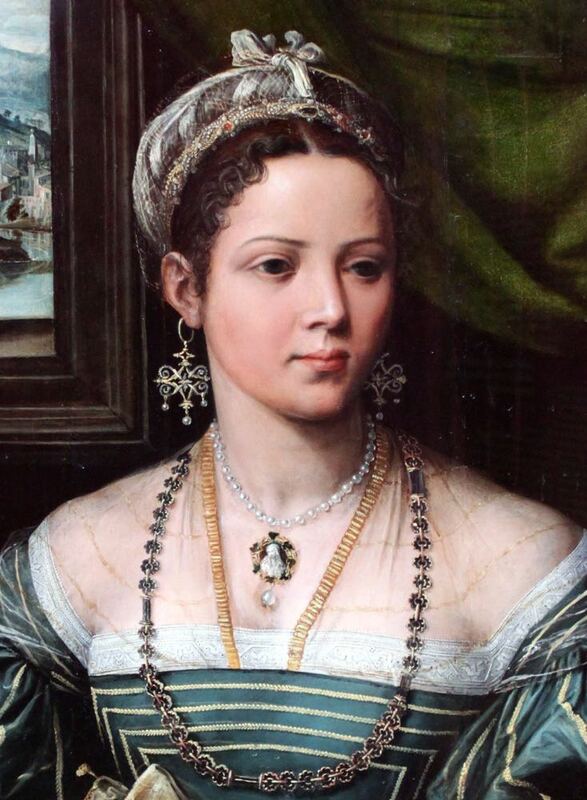 The sitters wealth is demonstrated through her jewellery: a gold chain, a pearl necklace, from which hangs a pendant that appears to depict the Virgin Mary, and enormous earrings from which dangle more pearls. In one hand she holds a pair of gloves, and in the other a fan of curled ostrich feathers. She rests her arm on a table covered with a carpet probably imported into Italy from the Ottoman Empire: evidence of Italy’s wealth and culture. Like so many of the costuming portraits we look at, this one was meant to display the sitters beauty, money, and learning. Beyond that, what do you think of the dress? This dress is absolutely gorgeous, and I can even forgive it the side puffs which look like they’d make the overall profile droop like an 1820-30s dress tends to do. But… How do they stay up if you’re not seated with your arms out, elbows jutting like bat wings? The trim is perfection, I love the repeats on the bodice.I thought at first that the necklaces weren’t happy together, but then I realized it is the broad gold band on the partelet arguing with the necklaces. 7 out of 10, I think because my complaints are half niggling and half probably due to ignorance of the sleeve structure. I really wish they’d kept the partelet edge as subtle as the other gold on it. That is exactly what I thought: It droops like a Romantic gown! I do love the color, and I love gold and petrol blue. Some of the proportions seem off, and who knows the reason. (The dress itself? The eye of the painter? Getting too bogged down in imagery and symbolism?) But I mostly mostly like it. Woops um…I changed my mind too late for the post. What a GORGEOUS colour! I love the structural simplicity of this gown with only the stripes of braid to relieve the effect of the silk satin. The touches of white are lovely and a perfect balance. I don’t love the low neckline/sheer barely-there chemisette, but what one can barely see, one can’t really be too fussed about., and I really don’t like the heavy chain necklace, and I’m a touch unconvinced by the gloves, but I really like everything else about her look. It’s bold and balanced, and the sitter looks fabulous. Want want want!!! This is just so gorgeous that I am doing virtual handsprings. I love the colour. As an historian of the Renaissance I would love to know who was portrayed. Utterly gorgeous. The colour, the striping, the sheer partlet, the jewellery — perfect! I do especially appreciate the design lines emphasized by the gold trim against the dark green. The whole gives the impression of sumptuousness without garishness. Wow! What a striking dress. The combination of the petrol blue colour and the graphic simplicity of the very rectilinear embroidery has a wonderfully strong visual impact and would easily adapt to an entirely contemporary and up-to-date dress. The clutter of expensive jewellery and accessories seems mismatched and too much to my modern eyes but then I’m just rating the dress itself so I’ll ignore it all. The restrained touches of brilliant white at the neckline and wrist adds a nice contrast and I particularly like the neat little trim of embroidered and folded tabs at the sleeve cuffs. A full 10. Not my favorite period, but this dress certainly is delicious. Stripes! Dark blue with a tinge of peacock! That sheer thing which I have just learned is called a partlet! But the jewelry! Big jewelry can often be a stumbling block for me, making these noble women in their huge complicated dresses look even more overdone and ridiculous – but I really like the jewelry here. The long dark rope, the elegant cameo, and those huge pearly earrings. The dress is over the top, but still very beautiful and memorable. I like the entire portrait, even the sitter’s air of perplexity (or sternness? perhaps the artist was aiming for that generically serene expression, but, if so, I think he missed slightly and thereby improved his work). The jewelry is gorgeous. The headwear confuses me and doesn’t seem right – a little too cobwebby for a dress with such a bold color and assertive lines. Yes this one’s a winner. The colour, the jewellery, the style tick all the boxes. I can even forgive the puffy sleeves which kind of scream 1970s bridesmaid to me. I like the color of the dress and the embellishments are interesting if nothing else. I like the placement of the trim on the bodice. The sleeves are not my favorite, but there is certainly much to interest oneself in the dress. I like it a lot. The white-work on the chemise is lovely and so is the blue and gold. I’m not usually a fan of puffs but I even rather like the sleeves. Absolutely beautiful! Wish I could tell how the sleeves are attached to the bodice, but that’s my curiosity more than a negative. However, I think this particular dress had sleeves that were sewn in; if not, there wouldn’t be enough structure to keep the dress up, the neckline is so low. Also, there’s no hint of gaps or puffs at the tops of the sleeves. THIS is exactly why I like these posts so much…it opens the way for others to share expertise! Interesting portrait, and not one I saw a decade ago, back when I was researching Italian Renaissance gowns for a LARP costume I was planning. I love the gown. It’s not my preferred style of gown for myself (though weight gain likely means it would look better on me than would have been the case 10 years ago), but it’s a lovely style and is elegantly trimmed in gold. That’s true despite the slightly slutty note struck by the transparent partlet and the extremely low neckline. I don’t like the shade of green (or is it blue?) much, but I’m willing to presume that the color has altered over time. I detest the accessories. 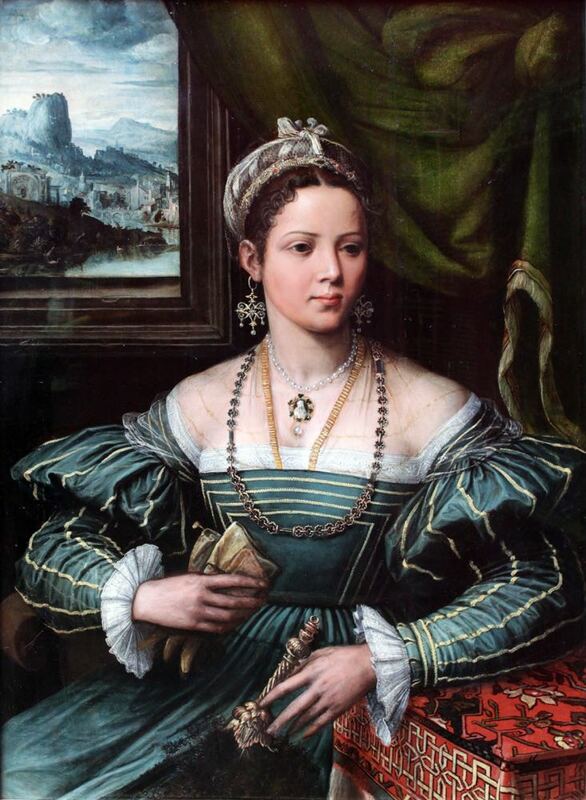 Italian Renaissance jewelry tends to be heavy, and the lady has piled it on to the point of absurdity. I think her hair is simply bound with ribbon and ornamented with a small circlet, but neither are in a shade that might complement the outfit. Still, this isn’t “Rate the Fashion Presentation,” it’s “Rate the Dress,” and the dress is marvelous except perhaps for that neckline. I give it 9.5 out of 10. Coming back…because the word “slutty” used for a woman of likely no power feels really weird to my heart. Utterly gorgeous! I love everything about it, the only thing I’d change is the gold and white combination, make them both match or make the gold silver. I’m a little disappointed we can’t see the hem of the gown (I’m curious if it has the same gold striping) but I love it. Not overly fond of the accessories, they don’t really go with the gown in my opinion, but I love the dress itself. LOVE IT! The overall scheme of the dress is rather simple and basic, but the extra frills are just enough to give an extra oomph while not being ostentatious and boisterous. It exudes class and money while not being over the top. Exquisite! I do wish that we could see more of the skirt; it looks rather high waisted to which I am rather partial. 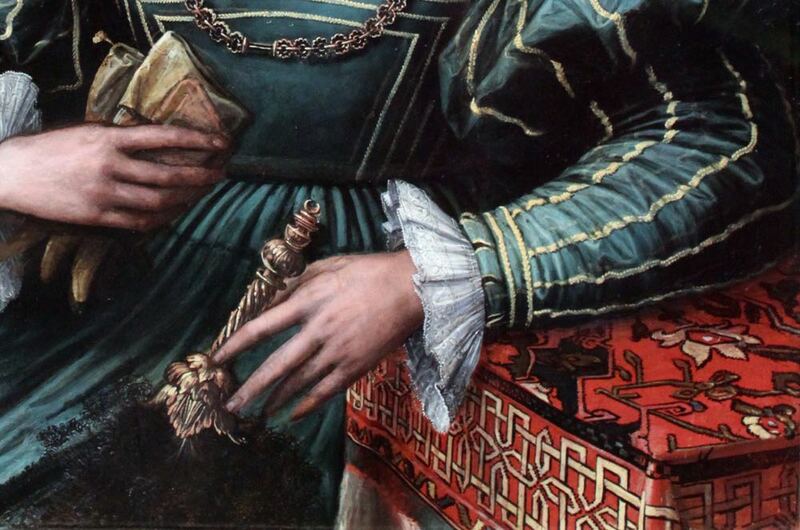 I like the pattern/sripe matching on the bodice, and love the lace at the cuff, With portraits, true color is always a question, but this green and gold is sumptuous. I would love to see this one in person. What a beautiful portrait! Oh Yes, 9/10 because I wan to see the skirt! Oh my goodness what an incredible portrait. She is so beautiful, and is it my imagination or does she look intelligent and bleak, so bleak about her uncomfortable adornments and all that it implies; a valuable commodity to be traded to the husband with the best prospects. I love the gown, I love this era of gown, probably because as a child I had the most beautifully illustrated story book mostly set in 16th century Europe with what I now can see were pretty accurate illustrations. I love the dramatic, linear simplicity of it all. I love that there is an olivey green curtain in the background that clashes with the bottle green of her gown, but the many gold elements and red carpet box ties it all in. 10/10 because it is exquisite n so many ways. This reminded me of my copy of Cinderella by Moira Kemp, which had glorious medieval/Renaissance era illustrations…. Just found a page showing the art! Oh! Looking at those luscious pictures is waaaaay more fun than studying. Thanks! Exquisite. The painting, fabric, dress design, sitter, all. Thrilling actually. So glad to be introduced to this painting. 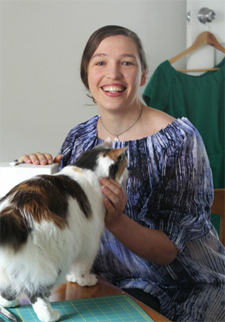 Love the dress, adore the workmanship! I think it would be terribly uncomfortable to wear, for all the reasons others have noted. about the temperament of the sitter. Very pretty, so far as I can see. I do wonder how those sleeves stay up. Looks like i am the only dissenter. Beautiful painting, gorgeous woman, but i don’t like the dress. My reaction was “meh”. Don’t like the colour, don’t like the stripes, don’t like the sleeves. 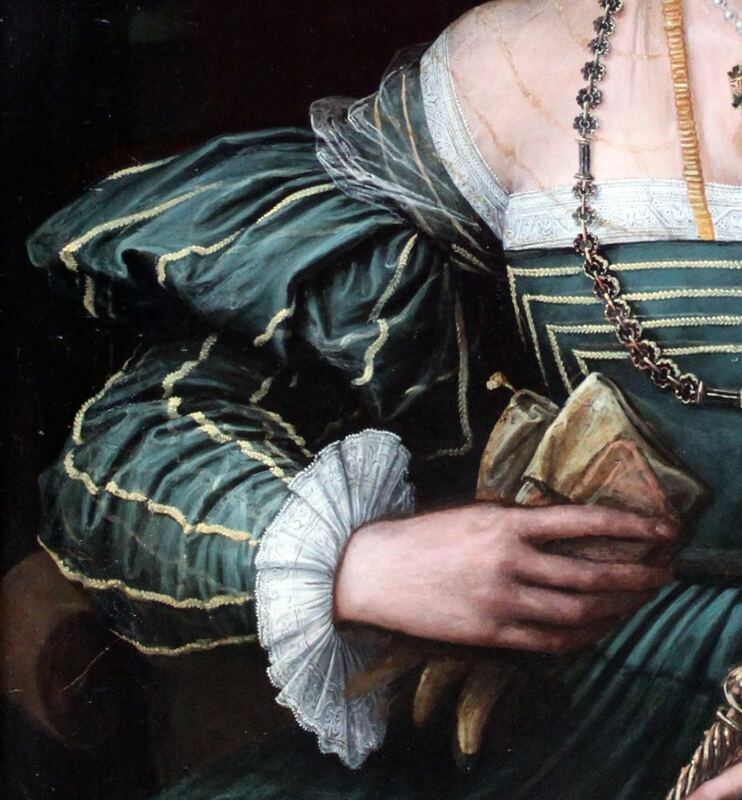 The quality of the painting, on the other hand, where in the close-ups we can see the stripes are semi-rick-rack braid; that’s pretty incredible. The chemise is lovely. Beautiful gown, gorgeous portrait, and a very pretty lady. 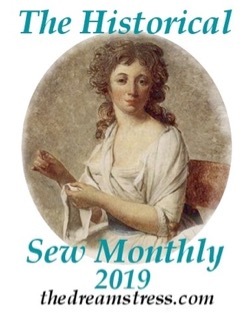 The striping is so effective, and I like the contrast between the very strong straight lines of the bodice with the soft gathers/pleats elsewhere. I’d prefer a higher neckline, since the partlet is so very sheer (the depiction of it is lovely). The handwork on the chemise and cuffs is so nice, and I like the the little tab edge at the end of the sleeve. There is a little much jewelry for my taste, and the chain looks heavy in relation to everything else, but those huge earrings are quite pretty. Her headdress is interesting, and gives a pretty, light effect, despite all the jewels in front. I’ve just realized that the fabric of the gown itself is rather sheer, which gives a different impression than what I saw at first glance, but it’s still lovely. I’m rather intrigued by the landscape behind her. I’ve come back to ask if anyone has an educated guess about the structure of the sleeves? At first glance, I just assumed that the entire sleeve was single-layer, with some sort of support beneath for the puffs (something like an 1820’s or 1830’s dress would have). I don’t know if I’m seeing this right, but there appears to be at least two layers, and possibly the tabbed trim is part of the under layer. In between the stripes of gold trim on the lower part of the sleeves, it looks like there are stripes lying beneath, and they might be lined up with the separations between the tabs. The upper puffed portion also appears to show stripes beneath, but I can’t tell if that is a consequence of the way the fabric is folded. I love how aspects of fashion come in and out. That bodice and sleeves wouldn’t be too out of place in the 1830’s.